As a business owner it is crucial you spend time and effort on the appearance of your premises. Many business owners invest heavily in their interior design, choice of flooring and furniture. This ensures a great first impression for clients and a similarly suitable working environment for employees. Less business owners think in depth about the exterior of their building. You may ensure your building is perfectly maintained and cleaned as it acts at the literal “shop window” for your business but what about the surrounding area? Investing in landscaping for your building’s front and creating a level of curb appeal to entice people in is one thing, but if other areas are left unkempt, visitors will notice. A key consideration in this area is your parking lot, very few business people think about their car lots and the impression they give to visiting customers and even staff. It is easy to see the parking lot as nothing more than a bit of tarmac which was laid when you started out or included when you bought your business. However, it can genuinely cause harm to your business if not looked after properly. You invest time and effort into creating a strong first impression when approaching the front door or the inside of your business but most of your clients may need to park up first. 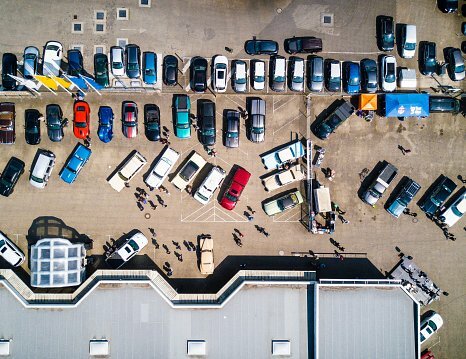 Potential customers may never consciously realize when they’re entering a clean, well-kept and properly maintained parking lot but they are guaranteed to notice a dirty one. If the first thing they see when visiting your business is neglect, it already gives them a poor impression. Their confidence in your business starts out at a lower level than you would like and for some, they may simply turn away. Whether you’ve got overflowing garbage cans, gum stuck to the floor, oil spills or bad odors in the area, a badly kept parking lot says plenty about a business. You may have issues with graffiti or vandalism and while it can be difficult to keep on top of, a respectable business needs to see dealing with these issues as an absolute focus for the wellbeing of their staff and to attract customers. Many of these common issues will turn customers away, whether you have a small parking space or something much bigger. A badly maintained car park is an immediate warning sign about security for visitors. If they do not feel safe leaving their car in your lot, they aren’t likely to even attempt visiting your business. The impact on security may also impact on your business as if you leave it neglected, you’re almost asking people to abuse it and use it incorrectly. A neglected car lot, even with security cameras, fencing and more, invites criminal activity and encourages illegal activity. It will immediately cause questions to be asked about the legitimacy of the business, whether the security measures are even functioning and most sensibly-minded customers will immediately go elsewhere. Dirty car lots attract criminals looking to break into cars and cause criminal damage but they also attract graffiti artists and general littering. If you aren’t taking the steps to look after your premises as a whole, it can very easily be taken advantage of. If your car lot is looking less than pristine then it may feel like a huge job to create a space staff and customers are happy to use. However, the many business benefits make it a vital task and not something you should readily ignore. Partnering with a professional cleaning company like us ensures you have the expert knowledge and experience to create a safe parking lot which you can be confident in and your customers can too. What’s more, working with professionals means you can skip the need to invest in materials and equipment to do the job, we have all that already and are ready and waiting to help bring your car lot back to its best. We can work on dubious stains, oil spills, algae and similar issues with the forecourt and floor of your car lot using a range of cleaning products. We can also utilize our commercial pressure washing equipment. Pressure washing effectively and efficiently removes grime and dirt from outdoor surfaces, ensuring cleanliness and better hygiene. Our experience pressure washing teams utilize the latest equipment to remove all stains, grime and any unwanted dirt from the car lot surface and even the walls, if applicable. We can also help your business deal with the impact of vandalism and graffiti. Both these issues can be extremely off putting for potential customers and of course upsetting and damaging for your business. Cleaning up graffiti is a simple process with the right equipment and materials. Our teams can work quickly so the impact of any vandalism or graffiti is minimized and the risk to your business reputation is kept as low as possible too. We work to return surfaces to their former state and ensure your premises and parking lot look as good as they can. Further investment in security measures is also a good idea for businesspeople wanting to create the best impression of their parking lots. It helps to give customers faith that you care about their security and are running a respectable business. Penn Jersey is proud to work with a wide range of local businesses, ensuring their exterior matches the high quality of their interior. Whether you need regular maintenance of your car lot or need to restore a neglected space to its best, our teams can’t wait to help. Contact us today to arrange a quote.